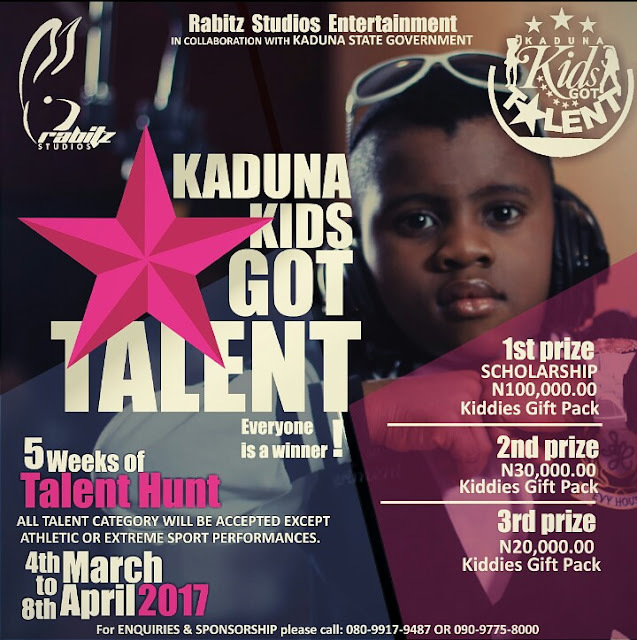 KADUNA KIDS GOT TALENT is a new and exciting reality television talent show that seeks to discover and highlight extra-ordinary talent in Kaduna. The main objective of the contest is to provide a platform on which young fresh talent can showcase their gifts to friends, family and the state as well as highlight the importance of encouraging children to discover and nurture their gifts. The contest will present contestants a rare opportunity to showcase their talent to a live audience and have their gift reviewed by a multifaceted and talented panel of judges. The Kids edition features children from the ages of 7 – 14 years. Contestants enter KADUNA KIDS GOT TALENT by completing and submitting a registration form and attending our auditions to showcase their talent to the council of judges. All contestants will be carefully appraised by the council of judges at various areas after which top three finalists from every area will be selected to officially enter into the final round of contest where there will be eliminations based on how well each contestant performs. The show will aired on national TV for full season of Five (5) weeks. All competition preliminary performances will be held at designated venues within local areas as will be communicated to contestants and guardians no less than a week to the date of competition. A preliminary competition for all talent acts will be held on March 4th, 2017. Preliminary competition performances will be scored by voting from both independent celebrity judges and the general public audience. Celebrity judge voting will account for 75% of each act’s preliminary performance score with the audience vote accounting for the remaining 25%. The three finalists from each location will advance to the final round of competition to be held on March 11th through April 8th 2017. The final competition will be scored on the basis of 25% from celebrity judge votes and 75% from the general public audience. All voting from the general public audience must be cast in person at the time of the performance. Cash prizes will be awarded to the top five finalists in order of voting. Top prize for the contest winner will be a complete scholarship through secondary school and cash reward. Meanwhile, all participants will be presented with varieties of books/kiddies for contesting (Everyone is a Winner!). Entrance applications will be accepted from qualified individuals and groups performing within the guidelines of contest talent categories. The contest will be limited to the first 75 qualifying applications received by the Center and will form the preliminary show. Applications forms are available at Rabitz Studios Entertainment (F6, Y.A. Ahmed House, Ahmadu Bello Way, Kaduna), at schools and also online at www.facebook.com/kidsgottalentng . For the purpose of this talent show, Kaduna State has been sub grouped into the following unit areas where preliminary contest will take place on March 4th, 2017. 1. Contestant(s) must be between the age of 7 and 14 years old, a resident of Kaduna state and be a current student enrolled in public or private school or home schooled. Student must be attending school within Grade 1–12. The application signature of the contestant’s guardian is required to confirm guardian’s support. If applicant is a group of individuals, all performing group members must qualify as if performing as an individual and must complete an application accompanied including all required signatures. Only one application Fee will be required for the group, however and forms will be pinned together. 2. Contest entrance fee is nonrefundable for all eligible contestants. Entrance fee payments MUST be made payable to Rabitz Studios Entertainment at the time of application. 3. Performances MUST meet qualifying talent categories: MUSICAL, INSTRUMENTAL or VOCAL, DANCE, VISUAL TRICKS, COMEDY, or OTHERS. No athletic or extreme sport performances will be allowed. 4. Contestant(s) is required to provide all music and props for their performance. Performance MUST be limited to five minutes or less. Any contestant unavailable to perform at his/her scheduled time slot will be eliminated from the contest. 5. Voting which results from the show, judges and audience will be final. Contest finalists will be notified in writing of their contest standings. Contest winners will be announced at the April 8th, 2017 final show.